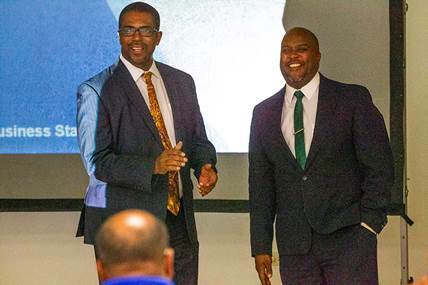 In a joint Ministry initiative, the Minister of Economic Development and Tourism Jamahl Simmons, and the Minister of Social Development and SportsMichael Weeks, participated in the launching of the Bermuda Economic Development Corporation (BEDC) sports club micro loan initiative, at a seminar that took place at the Bermuda Industrial Union. Representatives from local sports clubs were on hand at this development seminar to learn about this new initiative and the loan application process as well as receive information on all of the BEDC’s products to assist clubs. This new program will provide assistance to existing sports clubs through $25,000 loan guarantees to assist in achieving their goals and objectives. Minister Simmons said, “The Ministry of Economic Development and Tourism is excited to partner with the Ministry of Social Development and Sports to support the development of football, cricket and sailboat clubs. Only these clubs will be supported initially and after review of loan product take-up, the sports club micro loan product will hopefully be offered to other types of clubs as well. The Government’s 2017 Throne Speech touted our desire to support Sports Clubs with developing financial products to create more sustainable business models in an effort to better serve their members and the public at large. This evening, together with the Bermuda Economic Development Corporation and the Department of Youth Sport and Recreation, we are pleased to be able to continue to build on that promise. The Government, through BEDC and the Department Youth, Sport and Recreation, is proud to be leading with innovative Club-funding mechanisms to drive new economic success.